When you go shopping you have rights. This booklet, Be Smart - Buy Smart, will help you to understand your rights so that you can get a fair go. Follow the tips in this booklet and you will find that you can save time, money and trouble when you shop. A simple guide to your consumer rights under the Australian Consumer Law. When you go shopping you have rights. 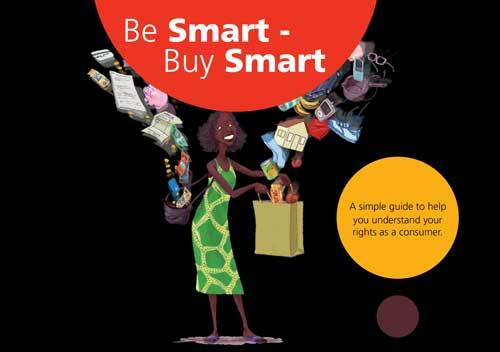 This booklet, Be Smart - Buy Smart, will help you to understand your rights so that you can get a fair go. Follow the tips in this booklet and you will find that you can save time, money and trouble when you shop. Do you have enough information about it? Can you get it cheaper from a different seller? Make sure you ask enough questions of the seller so that you understand the terms and conditions (the seller’s rules about what you want to buy). Always keep receipts. If you need help, contact your local fair trading agency. When you spend money, make sure you are given a receipt. If you have to sign anything this will usually mean it becomes a contract. Make sure you understand what it means and what you must do. Refunds – when can I get my money back? You can’t get your money back if you just change your mind about what you bought. isn’t the same as the sample you were shown. Guarantees – what if it is broken? A consumer guarantee gives you protection if something goes wrong with what you bought and you did nothing wrong. You have this right when you buy something from a business (not from a private seller). Speak to the seller first if things go wrong – they should arrange to have the problem fixed. Even if you have used the product before the problem started you may still be able to get a repair or refund. There are special laws to protect you if you buy a second-hand car, as long as you have bought it from a licensed dealer. Contact your local fair trading agency for details. Lay-by – can I pay bit by bit? When you buy something from a shop using lay-by, you pay a deposit and the seller puts it away for you until you have finished paying for it. You won’t be able to take it home until you have finished paying for it. Make sure you get a written lay-by agreement and receipts for all payments you make. Keep them until you collect the item and you have checked that it is just as you expected it to be. Prices should be shown on the item itself or on a shelf label near the items, and the price tag must display the truth. If you pick up an item with two price tags attached, the seller should sell it to you at the lower price. However, if the seller does not want to sell the item at the lower price, they can choose not to sell it at all. Advertising information should help you make a decision based on things like price, quality and purpose. But often advertising just confuses you. Don’t rely only on advertising when you are looking for information about what to buy or where. If the shop sign says that they check bags, the seller can ask to look inside your bags, but they must not touch your things. Shop staff can look, but not touch. If you say no, then the seller may ask you to leave the store or refuse to sell you any goods. They may call the police if they believe you have been shoplifting. If the seller tries to force a search of your bags or tries to stop you leaving, you should ask to speak to the store manager or ask that they call the police. Shop breakages - Who pays? If the break was all your fault, then the seller can ask you to pay for what broke. If you don’t, you could be taken to court. If it happened because of the seller’s mistakes then you should not be expected to pay for what broke. You use credit to buy things when you don’t have the cash. If you use credit you end up paying more than if you paid in cash. This is because you have to pay back the money you borrowed PLUS fees and charges (which may include interest). you cannot be charged interest on loans of $2,000 or less to be paid back in 16 days to a year. You should also be careful because if you don’t pay the money back on time, there will be extra costs. The length of time that you want to borrow the money for is called the term. The term affects the total amount you pay back – if the term is longer you end up paying more. The person or business who gives you credit is called a credit provider. Before you decide to use credit to buy something make sure you can afford to pay back the money, plus the extra charges. compare different deals offered by different credit providers. Make sure you understand all the fees and charges, the interest rate, the required repayments, whether you need to take out insurance or whether you need a guarantor. A guarantor is someone who promises to repay your loan if you can’t. shop around for the best deal. It is really important to add up all the costs before you sign a contract. Make sure you only borrow an amount of credit that you can afford to pay back. don’t sign anything unless you understand what you are signing. Once you have got a credit arrangement, keep the paperwork in a safe place, and always check the statements, which should come regularly from the credit provider in the mail – read and check that everything is correct. Paying back credit? What if I can’t pay? If you have trouble paying back credit you should speak to your credit provider first and see if they can help. You can also talk to a financial counsellor who may be able to help you to manage your money or negotiate with the credit provider. You can speak to a financial counsellor for free on 1800 007 007. If you are worried about credit, talk to others in the community and discuss your problems. If you need additional help, contact ASIC’s Indigenous helpline on 1300 365 957, or a financial counsellor. When a store offers credit it lets people get goods or services and pay the store later. This is often called book-up. You might be asked to leave your key card or debit card as security for the credit or book up. This means you can’t shop anywhere else using your card. Some traders ask for your PIN number – it is never safe to give this to anyone and stores should not ask for or keep your PIN. DO NOT TELL anyone your PIN. You might not get receipts. If you don’t get receipts you may not know how much you are spending. You might find it very hard to pay off your debts to the store. You could end up paying high book-up fees and lose track of how much you owe the store. You might not know how much the store is taking out of your account and how much you have left in your account. Make sure you keep an eye on this. Ask the store how much is being taken and how much book up debt you have. When should I use credit and book-up? Only use credit if you can afford it. Think about if you could save up the cash instead. Ask about fees, charges and interest. Also ask about other charges, such as fees for late repayments. Keep the paper work - receipts, contracts and statements. If you are worried about credit or book-up, talk to others in the community and discuss your problems. Talk to a financial counsellor for help to sort out your debts (ph 1800 007 007) or talk to ASIC’s Indigenous Outreach Program (ph 1300 365 957). Owning a car means paying for regular services, repairs, registration and sometimes insurance. You also need to think about the price of fuel – an efficient car engine is cheaper to run. If you aren’t paying cash for a car, look for the best loan to suit you. Shop around for the best deal and think about talking to a financial counsellor or community member before you sign anything. Work out how much you can afford to pay in loan repayments and remember the extra charges such as interest and fees. If you are buying a second-hand car then choose from a licensed second-hand dealer with a good reputation – they will usually provide service if problems arise. You can check if the dealer is licensed by contacting your local fair trading agency. See the back of this booklet for phone numbers. Remember – don’t sign anything until you are sure you are going to buy. Take time to read and understand all the documents before you sign them. Don’t sign blank or incomplete documents; and initial all changes. In some states/territories, if you buy from a licensed second-hand vehicle dealer you have a cooling-off right. This means that once you sign a contract you have some time to change your mind if you want to. Before signing a contract, check with your local fair trading agency if there are cooling off rights in your state/territory and how long you have to cool off. If you buy from a licensed dealer you have more protection than when buying from a private seller. All people who sell cars for a business must be licensed as a dealer. There is no warranty if you buy privately rather than through a dealer. If the car is very cheap, or too old, it may not come with a warranty. This means you have to pay yourself for everything that needs fixing. Get a mechanical inspection done by an independent mechanic that you trust. If you are using credit, make sure you can afford the repayments and shop around for the best deal for you. Mobile phones can cost you a lot. Some services may seem cheap but can quickly add up and may be hard to cancel. Don’t let someone borrow your phone unless you know how it will be used. Keep receipts and contracts so you have proof of purchase in case you have a problem. Do you want a fixed term call plan or a pre-paid call plan? A pre-paid service means you pay first so you can’t over-spend. But the actual calls may be more expensive on a pre-paid plan. Read the contract and find out what it means. Once you sign the contract you must pay the bills, so make sure you read and understand it. If you don’t understand it, don’t sign it. Get as much information as you can about services and charges; get it in writing so that there is no misunderstanding. You should find out what happens if you want to change or break a contract, or if your phone is lost, broken or stolen. Check if the phone will work in your local area or where you will be travelling regularly. Ask friends or people who use phones in the area, don’t rely only on coverage maps. A scam is a trick by someone wanting your money or information. Be careful if it seems ‘too good to be true’. Say ‘NO’ if you don’t understand. Report scams to WA ScamNet or SCAMwatch. If you are unhappy with something you have bought or with a service you have paid for, you have a right to complain. This can be a difficult thing to do sometimes – you may feel too angry, or perhaps you feel that it’s just bad luck and you have to put up with the results. Make sure you speak to the seller or manager of the business first. Calmly state what the problem is and what you would like them to do to fix it. Have all receipts, warranties and quotes with you because you may need to show them. Be polite, but firm. Don’t let them ignore the problem. Write notes, if you can, but at least make sure you know the name and position of anyone you speak to, and the date that you speak to them. what you want done to fix the problem e.g. a refund or repair, or the job done again without charge. Keep copies of any letters you send, and don’t send originals of receipts or guarantees, send copies. If you can’t resolve the problem with the business, contact your local fair trading agency. Explain the problem and tell us what actions you have taken. Someone else can write a complaint for you if you sign it. Disclaimer: Because this publication avoids the use of legal language, information about the law may have been summarised or expressed in general statements. This information should not be relied upon as a substitute for professional legal advice or reference to the actual legislation.